Region: New Orleans, walking distance to French Quarter. 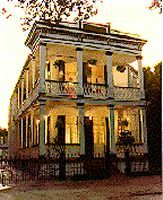 Experience the splendor of New Orleans in this Creole-style Bed & Breakfast Inn. Polished wood floors, ceiling fans and 13-foot ceilings highlight this historic district home, which is furnished with antiques and replicas.